China Southern Airlines (Guangzhou) has agreed to buy 10 Boeing 777-300 ERs, as the airline plans to expand its capacity to meet growing demand in Asia-Pacific and China. The prospective order is subject to final approval by the CAAC. Copyright Photo: John Adlard. The stretched Extended Range Triple Seven will be a new type for China Southern. The carrier currently operates four Boeing 777-200s and six 777-200 ERs. 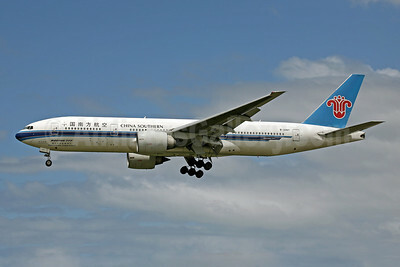 This entry was posted in China Southern Airlines and tagged China Southern Airlines on February 29, 2012 by Bruce Drum.